It was with great sadness that we reported the death of Mary Walsh Yates, daughter of Edna Wells and Arthur William Walsh, and the last surviving member of the second generation of descendants of J.W. Wells. She died September 28, 2008, at age 88, in her longtime home of Lincoln, Nebr. She is survived by her three children, Silas Burnham Yates, of Castine, Maine; Sharon Yates Ewers, of Phoenix; and Willard Wells Yates, of Arlington, Va., and three grandchildren. Mary Walsh Yates was born in Houghton, Michigan, on January 3, 1920. The family moved to Chicago in 1932. 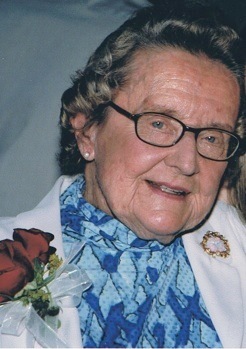 She attended the Dana Hall School in Wellesley, Mass., then graduated from Connecticut College in 1941. She married Silas Burnham Yates in early 1942 and spend the war years in California while her husband served in the Navy. The young couple moved to Lincoln, Nebraska, in 1945, where they remained. Mary was active in local theatre as a set designer and spent many years mastering the art of watercolor painting. But her lifelong passion was riding dressage horses. She was a founding member of the National Dressage Federation and rode almost every day until the age of 77. She retired then only because her horse went lame. She will be remembered by her family and many friends for her wonderful sense of humor, her outlandish and forcefully stated opinions, and her love of laughter. In subsequent e-mails, Sharon has sent some fascinating photos from Mary’s collection, which we have added to the Photo Gallery page. I had occasion to speak with Mary by phone in recent years and was deeply impressed by her warmth, her sharp mind, and her wise and interesting observations about family history and the life she had led. Her final months and weeks were comfortable, with frequent visits from her children. Her dog was with her right through the final few weeks of her life, which were spent in hospice care. The Wellses far and wide extend our deep and warm sympathies to Mary’s children and to others who knew and loved her.